Visiting a hospital can be an overwhelming experience for children and their families. 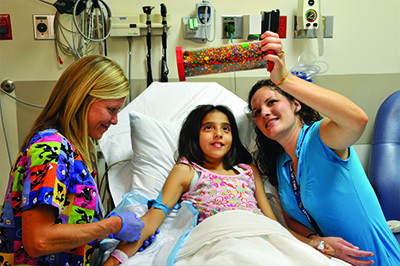 The Child Life Program at Peyton Manning Children’s Hospital at St. Vincent works to reduce the stress and anxiety that may be associated with the health care experience by meeting the developmental, psychosocial, and emotional needs of patients and families. Child Life specialists work with patients throughout the hospital, including inpatient units, radiology, outpatient surgery, and emergency medicine.